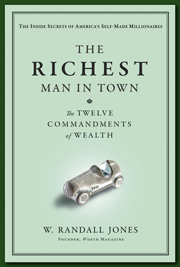 For the last couple of weeks, I have been telephonically touring the country, so to speak, speaking to radio hosts in virtually every market in America about my new book, The Richest Man in Town. I have enjoyed these chats immensely, but I find it so curious that the number one question I expected from all of these local radio shows, “Who is the richest man or woman in our town?” is not their first question. If it’s not about the money, and money can’t buy happiness, then what are RMITs doing it for? As I’ve said before, money is a way to keep track, not of how rich you are, but of how successful. The wealth that comes from success is how they know they’re executing. So at what point do RMITs decide they’ve done what they set out to do, and settle down to play golf or sit on the beach? The short answer is never. RMITs seek accomplishment, and derive their happiness from their achievements. But just because they are happy does not mean they are satisfied. In a letter thanking me for writing The Richest Man in Town, Jim Oelschlager, the richest man in Akron, Ohio, wrote, “Wow! What a spectacular book! My prediction is that it will be on the best seller-list soon.” Every writer loves to hear those words, and as they say, from Jim’s lips to God’s ears. He went on to say the book should be a textbook for graduate schools of business. That was a big wow for me. Oelschlager, who is unquestionably one of the most inspirational men I have ever interviewed, brought so much power to my book because of his extraordinary personal story.